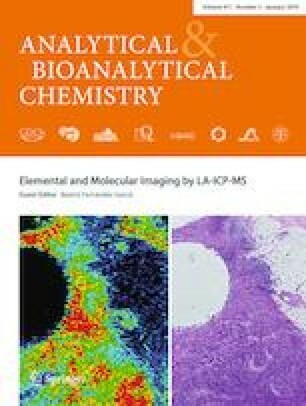 In this study, laser ablation-inductively coupled plasma-mass spectrometry (LA-ICP-MS) was applied to previously aged carbonaceous anodes from lithium ion batteries (LIBs). The electrodes were treated by cyclic aging in a lithium ion cell set-up with LiNi0.5Mn1,5O4 (LNMO) cathodes and hard carbon (HC)/mesocarbon microbead (MCMB) anodes. An inhomogeneous transition metal deposition pattern could be induced by replacing the spacer in a standard coin cell set-up with a washer. The inhomogeneity pattern matched the dimension of the washer depicted by the hole in the center. These transition metal (TM) patterns were used to optimize higher lateral scanning speeds and frequencies on the spatial resolution of the mapping experiments using LA-ICP-MS. Higher scanning speeds had an observable influence on the resolution of the obtained image and an overall saving of 60% with regard to time and gas consumption could be achieved. Additionally, the optimized method was applied to the cathode and separator in order to visualize the distribution and deposition pattern, respectively. The authors wish to thank the German Federal Ministry of Education and Research (BMBF) for funding this work in the project “Elektrolytlabor-4E” (03X4632) and the Ministry of Economic Affairs in North Rhine-Westphalia for funding the project “GrEEn” (W044A).